I *Heart* Infographics. – the ajayi effect. More and more information is being released relating to non profit social media marketing and fundraising efforts these days. I’m a data-monger and so it’s all good. However, I will say that I absolutely love it when insights are presented in pretty little infographics. 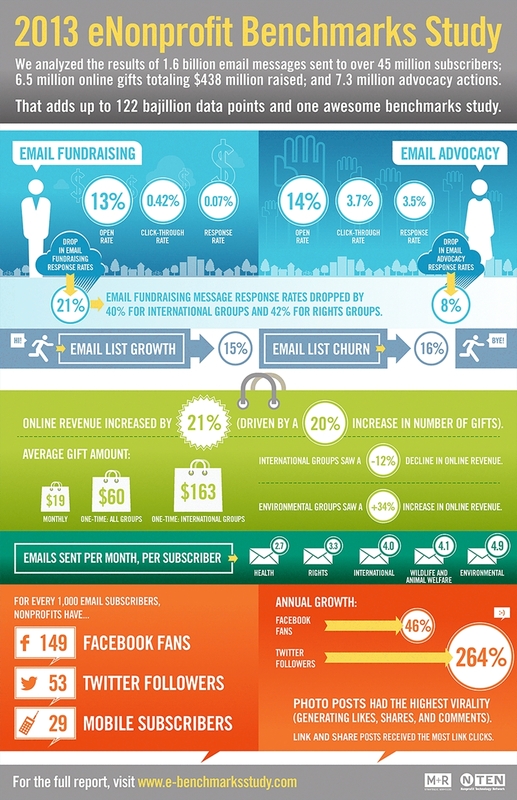 In my previous post, I shared research from the 2013 eNonprofit Benchmarks Study, conducted by M+R Strategic Services and NTEN which crowned email the Queen of fundraising tools. A 21% year-over-year increase in online revenue overall, with only International groups recording a decline in online giving. A sharp decline in certain key email metrics, such as a 14% decline in click-through rates for advocacy messages and 27% decline for fundraising messages. Those declines were driven mostly by Rights and International groups, whereas advocacy messages sent on behalf of Environmental groups performed best. Since 2011, online monthly giving grew 43%, or more than twice as fast as one-time giving. Although still a small percentage of overall giving, sustaining gifts for International groups now account for18% of revenue. Email is Still Queen of Fundraising. Why Morgan Stanley Is Civic-Minded.